Today's a very big day for me! It's my very first post and I'm so excited! I'm hoping that you'll enjoy what I have to share. Card making and paper flower making have become my passion. I'm obsessed!!! From the first moment I saw all of the magically beautiful projects that could be made with Heartfelt Creations products, I was hooked! I've only been at this for a few short years and I still have so much to learn but I so enjoy learning new things. It's not a good day if I don't learn something new. Lol. This is my latest project and I hope you like it! 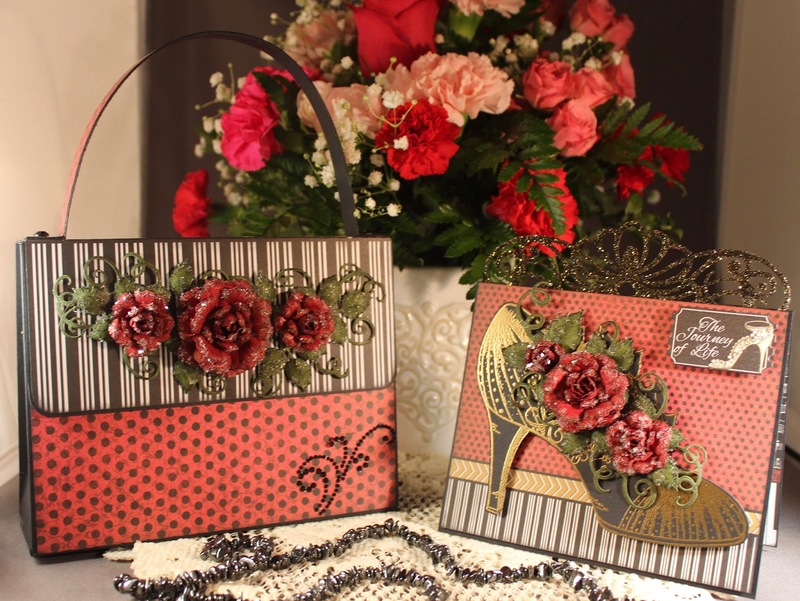 Cut two pieces from the Heartfelt Creations All Glammed Up Paper Collection 7 1/8" x 5 3/8" each for the front and back of the handbag and two pieces 7 1/8" x 3 5/8" to cover the outside and inside of the flap and one piece 11 3/4" x 5/8 to cover the handle. Distress the edges of all the papers with Ranger Distress Black Soot ink and adhere them to the front and back of the gift bag as shown here. Stamp the roses on dark red card stock with Memento Tuxedo Black ink using the HC Classic Rose Stamp and cut them out with the matching die. Shape the flowers following the directions in the Heartfelt Creations video on their site. Ink and cut them out with the matching die and shape. Be sure to make enough roses and vines for the handbag and the card. Add a little Dries Clear Glue to the edges of the roses and vines and sprinkle with Krystallos Shard Glass. Oh, I just love how this looks! Attach the roses and vines to the front of the bag and embellish the handle with black rhinestones. Add a black rhinestone flourish to the front. 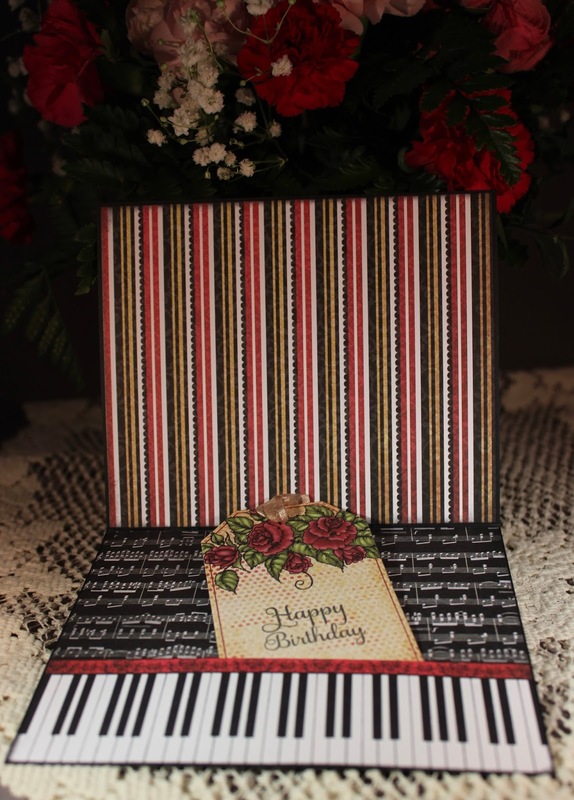 Create a tent fold card 5" high x 6" wide using black card stock. Select a piece of the designer paper and cut 4 5/8" x 5 5/8". Distress the edges with Black Soot ink. Cover a piece of 6" x 3" black cardstock with double sided adhesive and cut out using the HC Regals and Borders Die. Attach it to the back of the designer paper as shown and sprinkle the top with Sparkle n Sprinkle Midnight Gold glitter and burnish. Attach the designer paper with the border to the base card using dimensional tape. Stamp the shoe with the All Glammed Up Shoe Stamp using VersaMark on black card stock and heat emboss using gold embossing powder. Cut out with the All Glammed Up Shoe Die. Embellish with the roses and vines and adhere to the card with 3D Double Dots. Cut the Journey of Life ticket from the paper and attach it to the card using 3D Double Dots. Glitter the little shoe on the ticket. 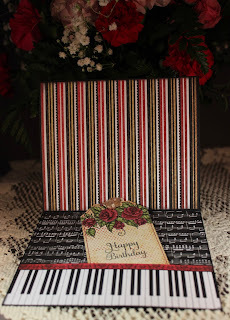 Decorate the inside of the card with designer paper, cut a pocket into the paper and add a tag from the paper collection and stamp with a sentiment. I hope you enjoyed the very long winded post and I can't thank you enough for stopping by. Janet makes the most beautifully crafted, one-of-a-kind masterpieces that I have ever seen. She uses an amazing combination of gold and silver gilded flowers, lace, gems and sparkles that create gorgeous works of art. Her creations are unbelievably fabulous!!! Thank you Kathleen! I think you're just a little prejudiced my dear Goddaughter. Love you! I couldn't agree more. She is so talented. My children absolutely look forward to every single card that get from Grandma. They are all one of a kind, personalized masterpieces!!!! Thank you my dear Daughter. You too are just a little prejudiced and I love you for it! Welcome to the world of blogging, Janet! Your projects are beautiful and very elegant! I look forward to stopping by more often to see the lovely creations you will be featuring! Thank you so much Tracey. Getting such a nice comment from a talented designer like you is an honor. Janet, I'm so glad you have decided to share your creations with the world - they are simply breathtaking! As a lucky recipient of some of your work, I can attest to the workmanship, creativity, and most importantly, love that you put into them! Thank you Jen for being one of my biggest cheerleaders! Hooray! You started a blog!!!! Good for you! Lovely card...and you know I love that pocket and tag! Thank you so much Kathy! Your kind words mean so much. Every card is a gift in itself! You will keep them forever because they reflect something personal about you! They are filled with love and I cherish every one! Finally....so happy to see you in blog land! A shame I can not see more of your work but If it is anything like this post...move over here she comes! love the roses...I am also a bling kinda gal...lol. inky hugs and all the best with the voting. Congratulations on your first blog post! And it is a stunner! Just wanted to say hello and wish you luck in the semi-finals for Heartfelt Creations! Hello Glenda and thank you so much for your kind words. Thank you so much Olga! I really appreciate your comment. Beautiful projects and congratulations on being a Semi Finalist. Best of luck! Congratulations on starting your blog and becoming a semi-finalist for HC. I too am new to this craft but love heartfelt creations. Your work I've seen looks like you will be a great choice. Beautiful. So glad you started a blog for the world to see your wonderful creations.